Return to Return to Ravnica! (No, that is not a typo–we’ve already returned to Ravnica once). 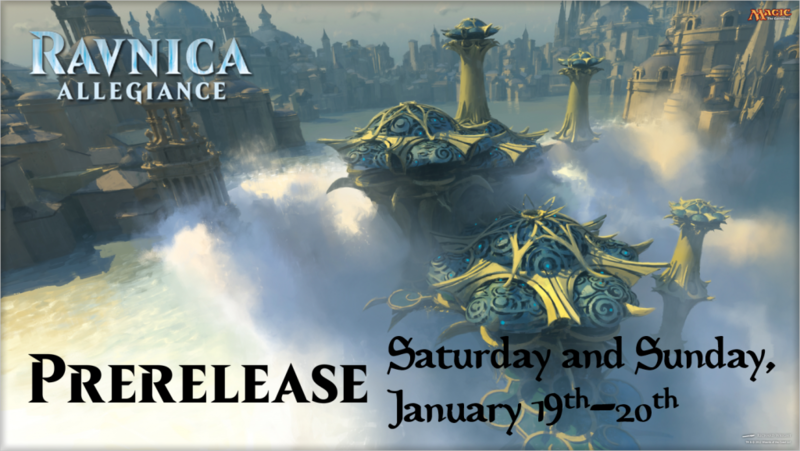 Kick off the release of the Ravnica Allegiance in style with exclusive pre-release events a full week prior to set release. from the cards in their kit and basic lands (bring your own or use ours). Since Ravnica Allegiance is based on the ten guilds of Ravnica, like previous sets on this plane, players will be able to choose their guild allegiance and receive a special kit to help them build their deck. For this event, the guilds are: Azorius (White/Blue), Rakdos (Black/Red), Gruul (Red/Green), Simic (Green/Blue), and Orzhov (White/Black). There are four separate events throughout the weekend in Nashua. Sealed deck at midnight Saturday, Sealed deck at 11AM Saturday, Two-Headed Giant Sealed at 4PM on Saturday, and Sealed deck at 11AM on Sunday. There will be one event in Londonderry–Sealed deck at 11AM Saturday. Pre-registration (at the store or over the phone) is STRONGLY recommended. Pre-Release events are very popular and have sold out before. In addition, Guild selections will be limited per event to ensure even distribution across the entire weekend. Avoid disappointment and pre-register early! There will be 3 or 4 total swiss rounds (depending on event) with prize payouts based on your overall record in the event. In addition, each player who wins a round will get a free draw from our special Promo Board of Mystery! The Board of Mystery will be seeded with lots of promos from previous releases, including some special surprises!